almost twice the size of all the others and I set that one aside. of the common loquat seeds. (I feel bad that I did not think to get a photo of the fruit before I opened it). so I have no idea what it could possibly be. any ideas as to what the mutant could be ? 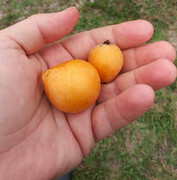 No idea, but this year the local loquat tree I get fruit from had the biggest loquat I ever saw. I've eaten off this tree for about five years and never noticed one this large. It tasted like the others and I can't remember if the seeds were unusually large, but I did have to take a pic of the large loquat! I don't like the fruit enough to have my own tree, and there's plenty on the neighborhood tree to feed me and a lot of loquat-loving bugs . . .